I’ve now seen Inception three or four times since I watched it for the first time in the theatre four & a half years ago. And while it still holds up as a great & original piece of filmmaking, one fact is becoming much clearer; Ellen Page is a bad actress. She got very lucky that Juno struck the right cord at the right time and became a hit, but other than that she has very little to offer. For that matter, Diablo Cody got lucky too, since it’s become obvious that she has nothing else to say worth listening to. But that movie aside, Page has no natural talent, no adaptability, no strength of presence that demands attention. She’s a one trick pony who is too easily exposed, as in her role as Ariadne (stupid name choice) in this film. Give Christopher Nolan some blame too, as each of her lines seems crafted to flop, but Page deserves the brunt of the criticism. And why, you may ask, am I so hard on her here? Because her flaws may be the only miscues in what would otherwise be a near-perfect film. 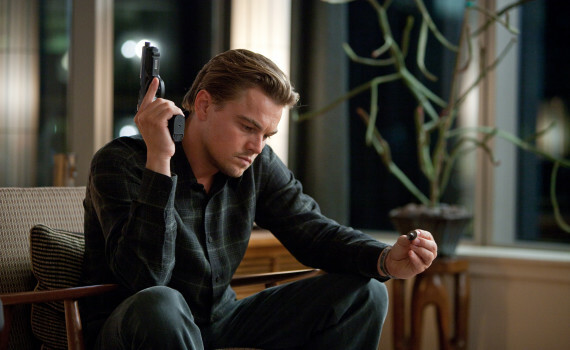 With a movie like Inception, it’s hard to summarize the plot in a few sentences, let alone a few paragraphs. It’s a story that is challenging to follow, that changes each time you watch, and will be debatable forever. But anyway, here are the bare bones. Cobb is a master of Extraction, the process of going into a subject’s dreams and bringing out any information you choose, regardless of the depth of secrecy. He uses this talent to make a lot of money, he & his team traveling all over the globe while working for giant corporations, in part because Cobb can’t legally return to the U.S., pending legal trouble. After a botched job, a rich & powerful man named Saito hires Cobb & his crew to not Extract an idea from a competitor, but insert one instead, a process thought to be impossible called Inception. Cobb is confident that he can implant an idea into another man’s head through his dreams, thought it won’t be easy. If he can pull off the feat, Saito will fix his charges state-side, letting Cobb return to his children and a relatively normal life. But Cobb must rely on his crew, avoid his own haunted memories, and go deeper into the dream world than anyone has ever gone before if he is to ever get back home again. Other than Ellen Page, who I found really blah & who had all the worst lines in the movie, and other than the “chemist” Yusuf, who was just a throw-away part, this is a pretty impeccable film. From the concept to the delivery, Inception succeeds in every way. It is, at its core, the best heist movie ever made. It takes the standard set up (the team, the mark, the job, the getaway) and modernizes it, or, in a way, sci-fis it, creating something comfortably old but cleverly new. Nolan directed & wrote this film, and I’m wondering if he might start creeping up on my Top Directors list. Memento, Batman Begins, The Prestige, Inception, Interstellar; all phenomenally dark & detailed films that are at once creative & entertaining. That’s his true talent, bringing originality to enjoyable films, crafting them for all audiences. Credit Leo as Cobb in a complicated role, one that could have sunk under a less talented actor. JGL was handsome & wonderful, as always, and Tom Hardy was perfectly cast. With great music, great mood, and an ending that will have you arguing for days, Inception is a sci-fi/action/thriller that you’ll want to watch again.